This past weekend I witnessed what happens when your mouth runs faster than your feet. 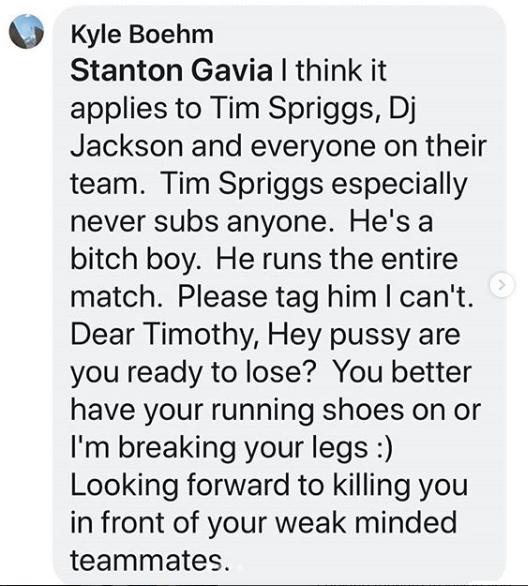 I was coaching Tim Spriggs in his second match at Subversiv, and noticed that he was being particularly rough. Hard head snaps, palming of the face, fist chokes, and general rough housing. Tim ended up winning in overtime after grinding his way through a victory against his opponent whose game plan seemed to be to survive. After learning this, I was really surprised Tim didn’t straight out murder him, lol! What’s more, it was unprovoked. I’m not sure what makes someone go out of their way to insult someone and their friends for no good reason. Then, when they met face-to-face, he doesn’t seem to have that same bravado. They faced off, shook hands, and I was none the wiser to this whole situation. Ironically, it was his opponent who was running the whole match, not attempting anything in regulation. Tim passed guard and mounted almost immediately, and his opponent just locked hands and stayed put for nearly 5 minutes. It seemed to me the game plan was to go into overtime and win by riding time, which backfired because Tim was the superior grappler all around. I understand that getting in your opponent’s head can be strategic and produce results. Was Kyle trying to rile up Tim and make him over aggressive? It doesn’t seem like it, because he did nothing to take advantage of it. Is this just more of low grade trash talk to get social media attention? Probably, and I’m helping fan this flame I suppose. Shame on me. I do not like the WWE tactics of the modern era to get attention. Yes, it works very well. Connor McGregor wouldn’t be a multi-millionaire without it. But easy marketing of fights come at a cost. While you might be in on the charade, millionaires of followers across the world are not. They see an incredible successful athlete and want to idolize him – mimicking everything he does. Being a braggart and disrespectful punk becomes something admirable to those who follow MMA. If it was just one voice, it wouldn’t be so bad. But it seems everyone is trying to follow McGregor’s example and we just have a mob of poor trash talkers. This doesn’t send a good message of what the martial arts is supposed to be about. I can’t imagine that parents want their kids to be running their mouths like Connor, and if they believe he is a representative of MMA as a whole, why would the put their kids in the martial arts? I prefer the humble approach let your actions speak for themselves. Connor is hilarious at times but not my style I’m backing Khabib when they fight they are both talent. I follow my own principles.